The shirt is made of a soft knit and comes with three sleeve lengths: tank top, t-shirt and long sleeve. It’s available in a variety of colors and can be customized. 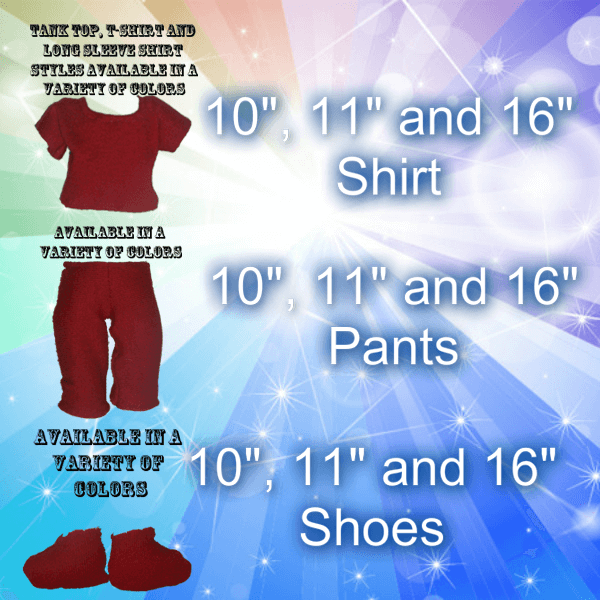 Pants are made of a soft knit and come in a variety of colors. Be sure to specify if you want pants for a regular human character or a feline-human character – the difference is a hole for the tail of the feline characters! Shoes are made of a soft knit and come in a variety of colors. These don’t come as a collection, they are individual purchase options. The outfits all come in a variety of colors. The shirt, which comes as either a tank top, t-shirt or long-sleeve shirt, can have a short message painted on it, as well. Things like “Too hot to handle!” or “BFF” fit very well on the small area. Though the shoes aren’t meant to be dangerous, it is recommended that they be put away (or at least out of reach) so small children cannot choke on them.